Barcelona captain Xavi has dedicated the Spanish side's dramatic win at Villarreal to the memory of former coach Tito Vilanova. The Catalan club fought back from a two-goal deficit to win 3-2 in their first game since Vilanova died aged 45 after a long battle against cancer. "We showed pride to be able to win the game," said 34-year-old midfielder Xavi afterwards. "We wanted to dedicate it to Tito and his family. It was our homage to him." 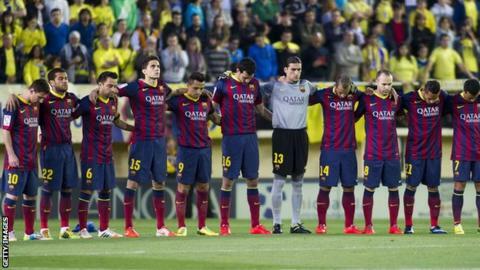 Sunday's trip to Villarreal came under difficult circumstances for the grieving Barcelona players, just 48 hours after the death of Vilanova was announced. Lionel Messi's late winner reignited their faint hopes of retaining the title which they won less than 12 months ago under the guidance of Vilanova, before he was forced to quit because of his health problems. "It was one of the most difficult days to play. The body didn't feel right," added Spain international Xavi. "We have lost a reference of what Barcelona means and he will always be an example." Barcelona's fightback, where all three goals came in the space of 18 second-half minutes, means they are four points adrift of La Liga leaders Atletico Madrid with three matches left. The odds are stacked against the Catalans with Atletico - who beat Valencia earlier on Sunday - needing just two more wins to become champions for the first time since 1996. But Argentina international Javier Mascherano promised Barca will take inspiration from Vilanova's personal battle as they try to finish ahead of Atletico and third-placed Real Madrid. "What we have to do is fight until the end like Tito, we have a lot of fight left in us," said the ex-Liverpool and West Ham player. "We know that his battle was a hard one, but we never could have imagined that this would happen, until it did." Xavi's long-time midfield partner Andres Iniesta added: "The death of Tito has really affected us, we knew him for a very long time. "With him we won the league with a points haul of 100 points, but what we'll remember about him is what he gave us on a personal level."